If you’ve been following me on Instagram and Facebook, you may have noticed by now that I’m just getting back from a week long vacation in Florida. While there were many beautiful, fun, and exhilarating stops on my journey, returning to the city of St. Augustine, the home of my alma mater, was a major highlight of my trip to Florida. 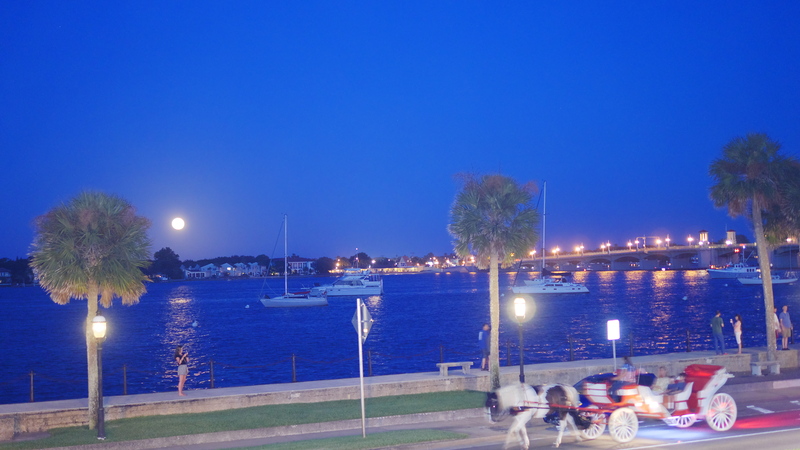 Whether you are looking for relaxation, family fun, or beautiful views, St. Augustine has it all. To show each location in depth, I separated this list of 10 places you’d love to visit in St. Augustine into two parts. 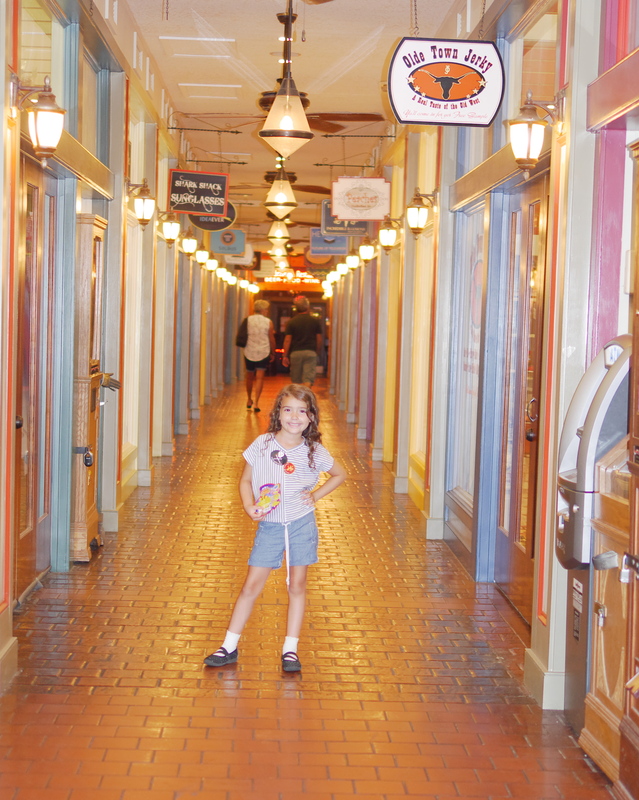 First, the Colonial Quarter is one of the most fun, interactive spots for kids to visit. Here, you can go back in time to experience what life was like in St. Augustine during each century. You can stop by many different exhibits to check out historical memorabilia. After a long road trip, this was the perfect location for my kids. They could run from exhibit to exhibit, and even though they don’t know a lot about Florida’s history, they loved interacting with each station. Adults will also enjoy visiting here. Going from century to century and watching St. Augustine change is a fun, interesting experience for travelers who love learning about history. One of the best spots here is the archaeological dig. 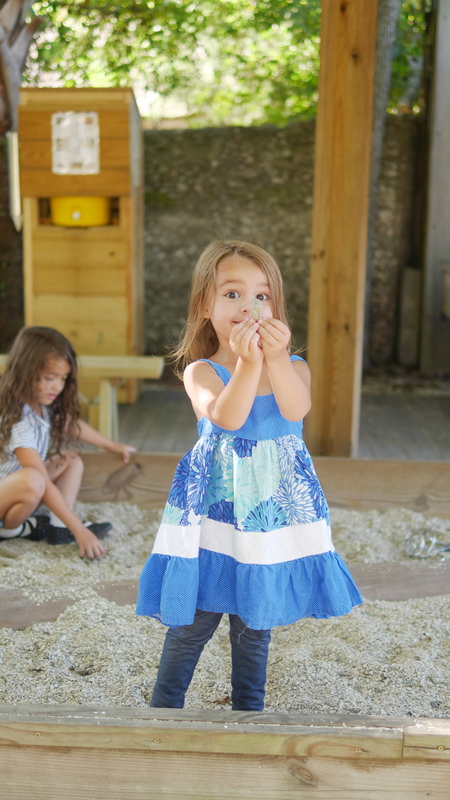 Kids can go on a hunt in the sand for different objects. This is not a very messy activity, but it is incredibly enjoyable. After a very long road trip, my daughters were very appreciative of the opportunity to dig for hidden goods. We visited about half an hour before closing time, which ended up being perfect because nobody else was at the Colonial Quarter at that time. This was a very peaceful experience for the whole family. 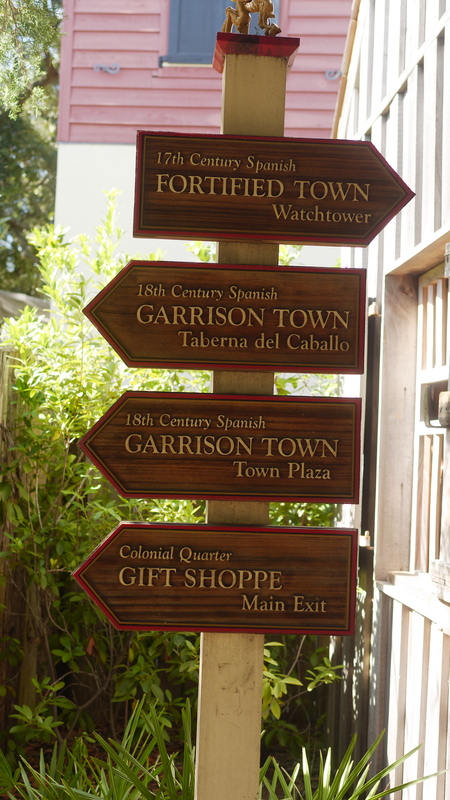 In other areas of the Colonial Quarter, you can see how people actually lived long ago. 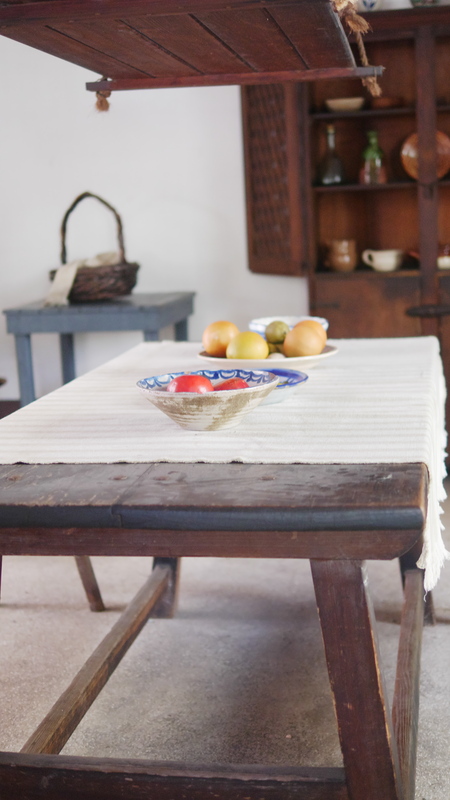 From examining the furniture and the food the people ate, you can learn a lot about what life was like for early colonial settlers. 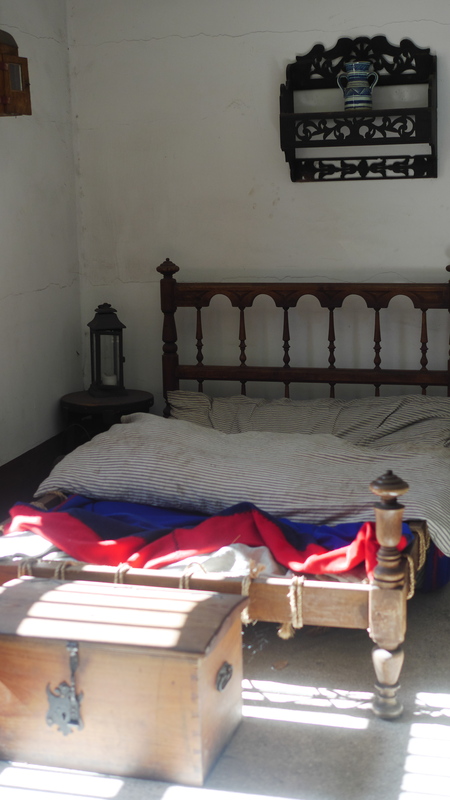 One of the most eye opening exhibits was the bedroom. Here, we saw one rather poorly constructed adult bed along with a place for a child to sleep on the floor. My children were shocked to imagine having to sleep on the floor with only a blanket and a hard pillow. 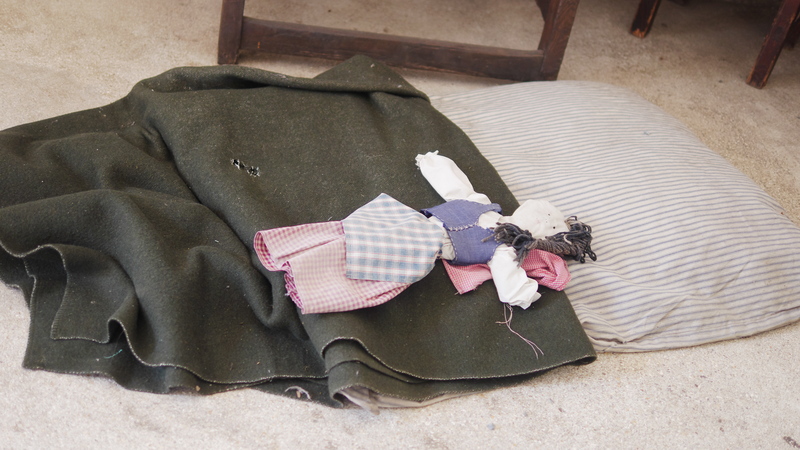 One thing they did enjoy seeing was that long ago, children had dolls to cuddle with at night. Another amazing part of the Colonial Quarter is the lookout, where you get one of the best direct views of the Castillo de San Marcos. 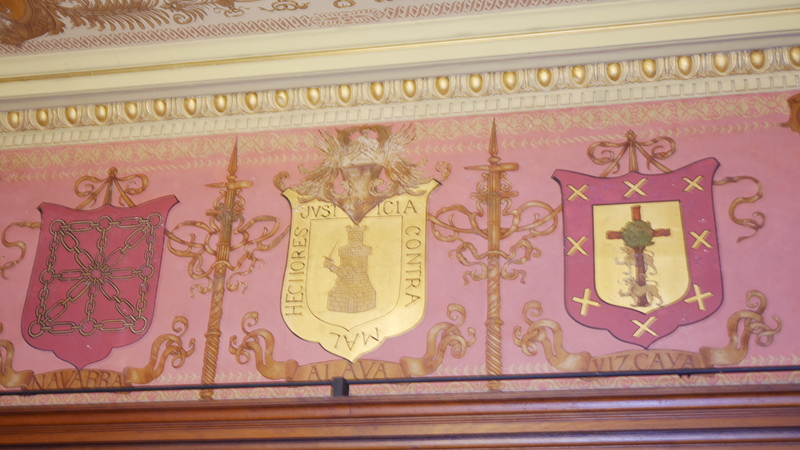 Later in Part 2, I will explain the importance of the Castillo. 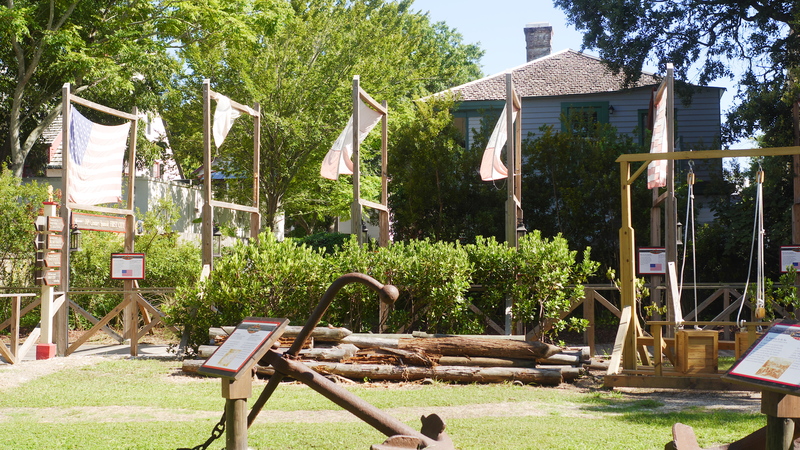 From the lookout, you can also see the Pirate and Treasure Museum, which is only a short walk away from the Colonial Quarter. 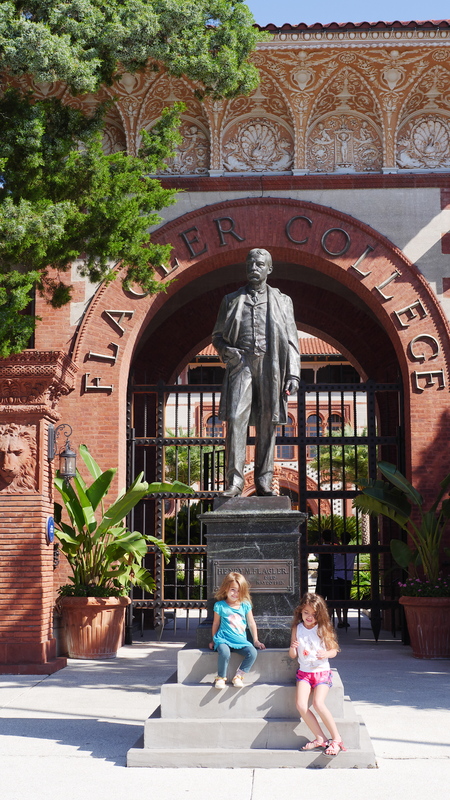 As a teacher, I highly recommend bringing your kids to visit Flagler College. My parents brought me to St. Augustine when I was about 10 years old. Later, when I discovered there was a college there, I knew I had to attend. Going to school there was an excellent experience. While the college campus is incredibly gorgeous, the student body is overall made up of very focused and driven students. Studying alongside such hardworking students was one reason I was later accepted into a program at Vanderbilt University. 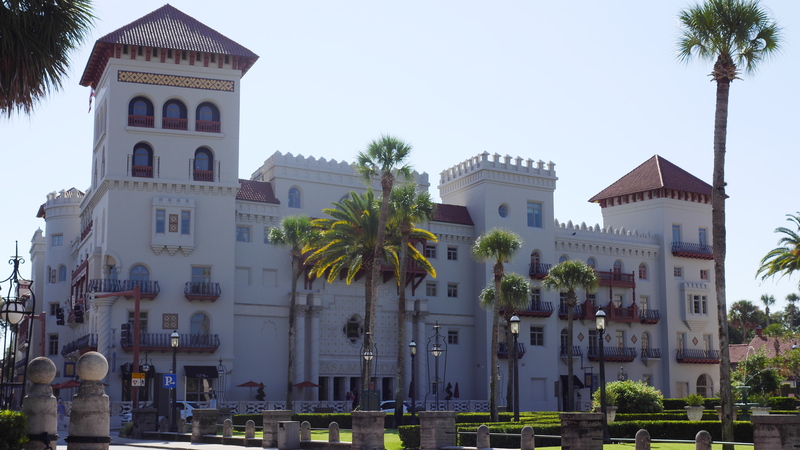 Not only does Flagler College boast an incredible faculty as well as strong academics with an experiential, immersive educational focus, but it is also a beautiful tourist destination. 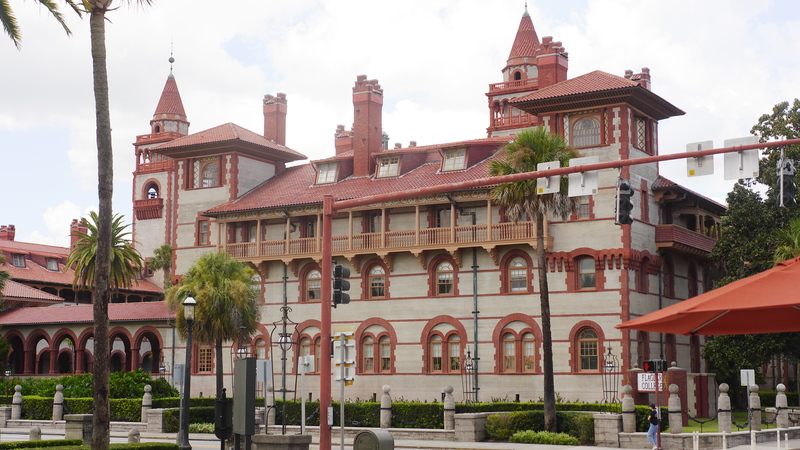 Many visitors will take a tour of the college just to hear about the history of the buildings, part of which used to be the Ponce de León Hotel, a luxury hotel built in 1888. The courtyard of the Ponce de León Hotel has a beautiful frog and toad fountain that my children loved. If you take a tour of the college, you will be allowed to enter what is now the Dining Hall. 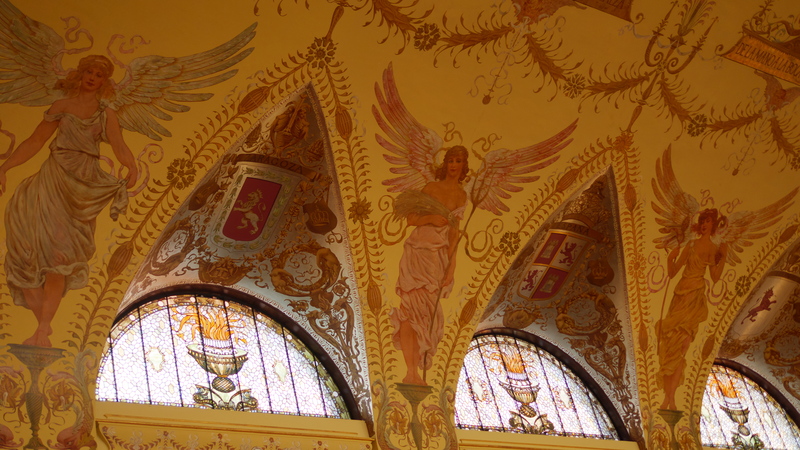 Inside, there are beautiful paintings and Louis Tiffany Comfort stained glass windows. Another nice way to check out the exterior of the college campus is to take a horse and carriage ride around the city. 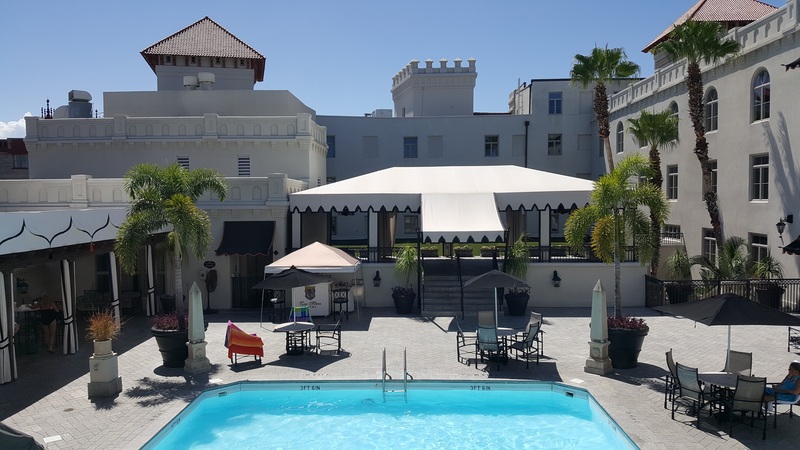 One of the finest Kessler Autograph Collection hotels is the Moroccan-themed Casa Monica Hotel, which is a resort and spa well worth visiting and staying at during your stay in St. Augustine. 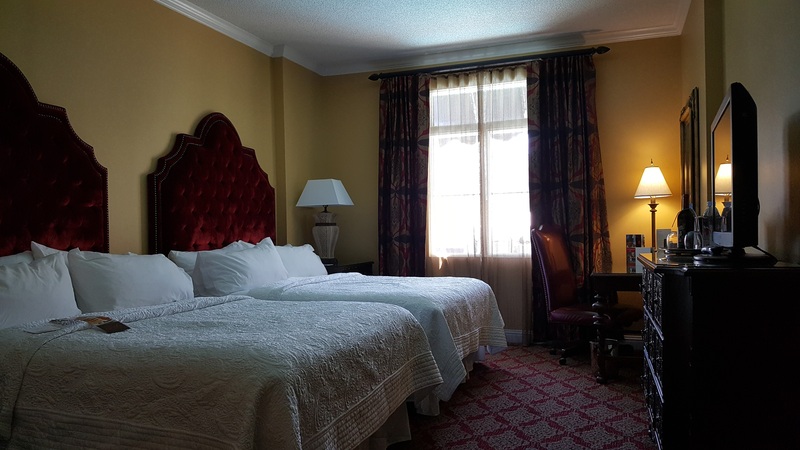 Located in the heart of the Historic District in St. Augustine, the hotel is a short walk to many attractions and only a short drive across the Bridge of Lions if you want to leave the downtown area. 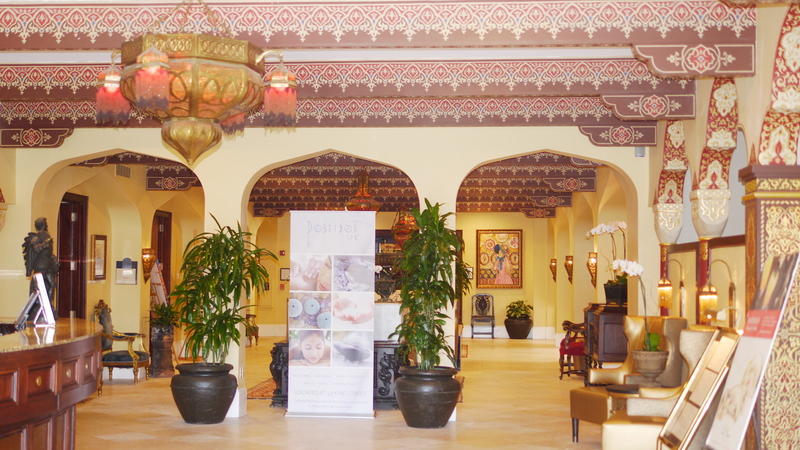 Although the exterior of the hotel is gorgeous, the interior is beautiful too. All of the picturesque details make this a location well worth checking out when you visit St. Augustine. If you decide to stay a night here, the rooms have gorgeous, luxurious touches. Below, you can see a room with a double queen and a pool view. There is plenty of space for guests inside the room. Looking out from the room, you can see the incredible pool, which was very empty and quiet. Even in the heat of summer, the hot tub was also quite nice to visit. Next to the pool, you can relax at a cabana. Since I was celebrating my anniversary of getting married and having my wedding reception at the Casa Monica Hotel, the staff surprised me with a generous chocolate basket from Claude’s Chocolate. 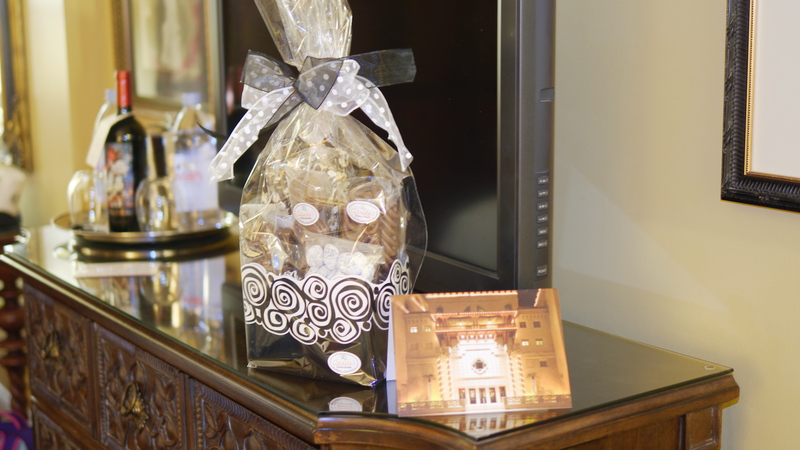 This personal attention is one of the many reasons why the hotel is a nice location to stay at when you’re visiting. When we arrived, we visited the restaurant in the lobby where we ordered an array of small dishes. The food was filling yet light. 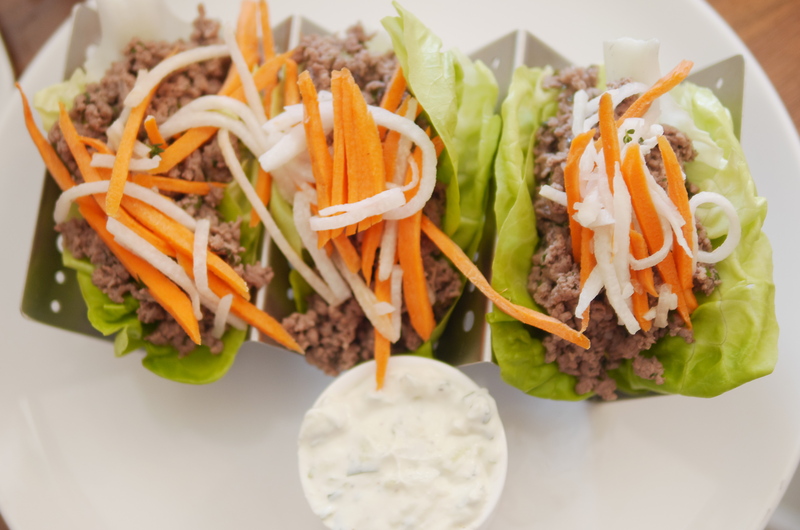 After a long drive, the Lamb Lettuce Wraps were the perfect dish. We also ordered the Mushroom Pizza. 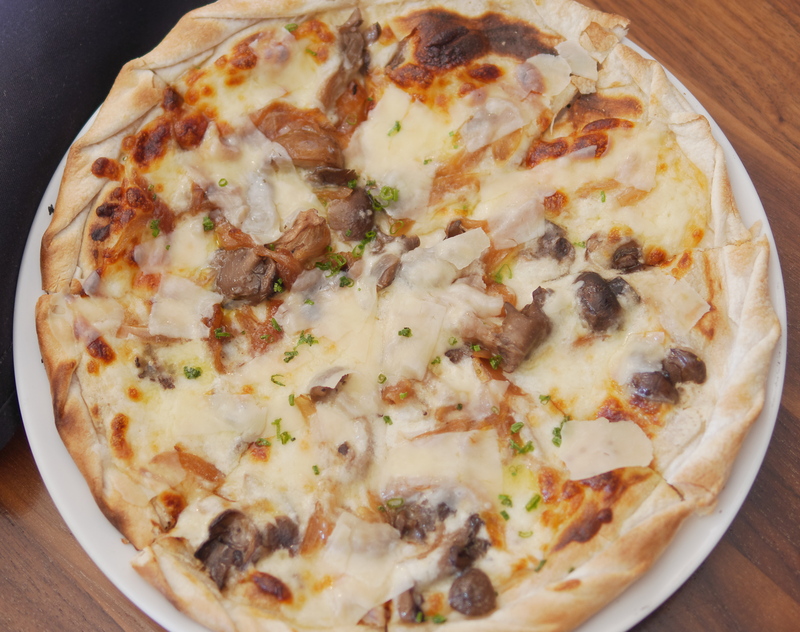 I loved the delicious cheese, mushrooms, and onions. The crust was delicious too! Later in the day, we stopped at the Frida Taqueria & Tequila Bar. Located on St. Augustine’s historic bayfront, the restaurant serves authentic Mexican cuisine. Dining on the balcony offers an idyllic view of the Bridge of Lions. Whether it is daytime or nighttime, the view of the bayfront is incredible. 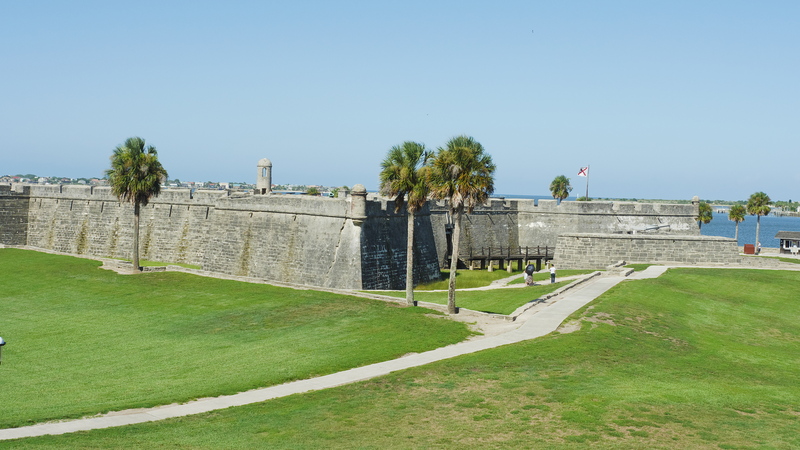 You can see ships passing by, the Castillo de San Marcos, and many horse and carriage rides passing through the streets. While there are many places to dine in historic St. Augustine, Frida’s offers an incredible fish taco that you have to try. 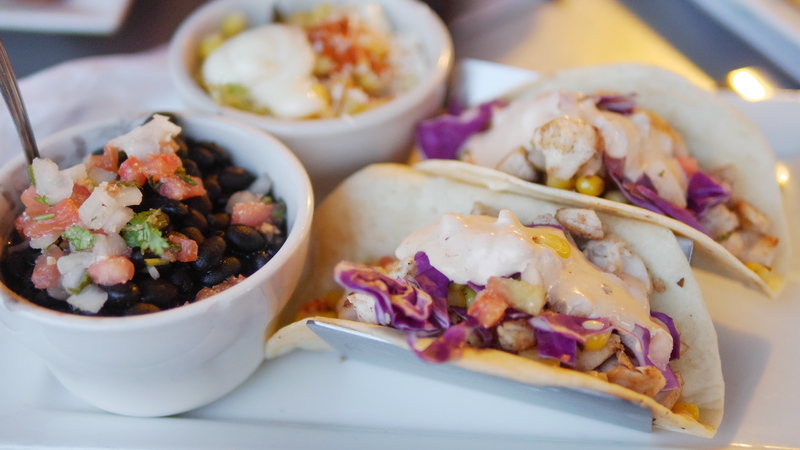 Chunks of freshly caught fish are added to a mixture of corn, cabbage, Pico de Gallo, and Chipotle sauce. Eating this while overlooking the water makes you truly experience being on a Florida vacation. Although the service was hit or miss at Frida’s, the fish taco was delectable and the view was incredible. While visiting, take the time to walk through St. George Street. 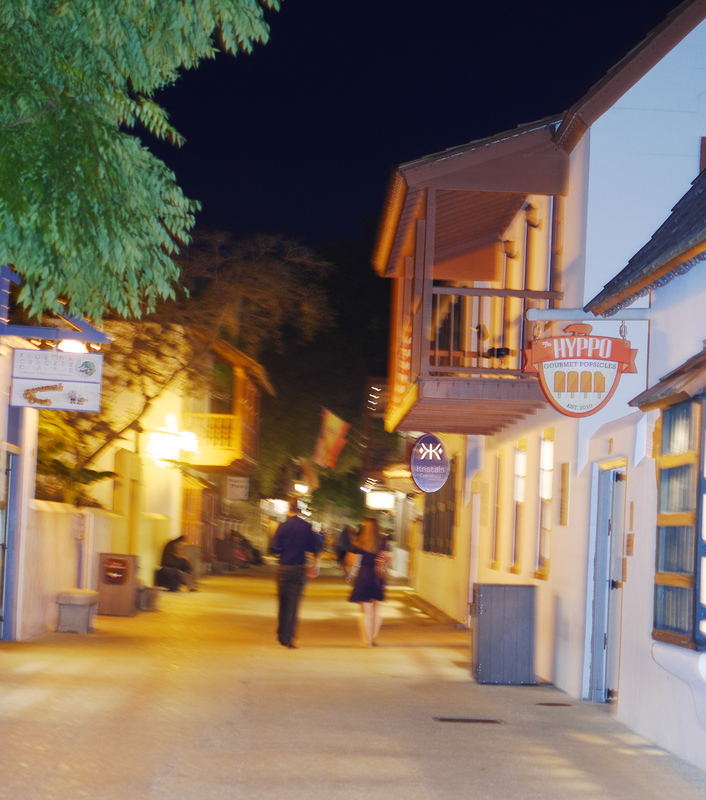 Located in the heart of St. Augustine, St. George Street has many shops to peek in as well as attractions to visit. Whether you are walking at night or during the day, you will find that the streets are not overly crowded. Cars can’t pass through the main walking area, so you can take a leisurely stroll. There are many places to stop in as you walk. We discovered hot sauce shops that offer tastings. Another favorite spot was a magic shop called Theatre Magic that does live demonstrations. My daughter was excited to buy a DVD magic kit to learn how to do the magic tricks herself. St. George Street isn’t a very long walk. If you have small kids, you might not need a stroller, unless you take a long walking tour or sign up for the Ghost Tour. As you walk, you will find many places to get dessert. The fudge and ice cream shops are well worth visiting. We ordered ice cream at Kilwin’s, and we loved it. There was a nice place to sit and cool down right outside of their store. 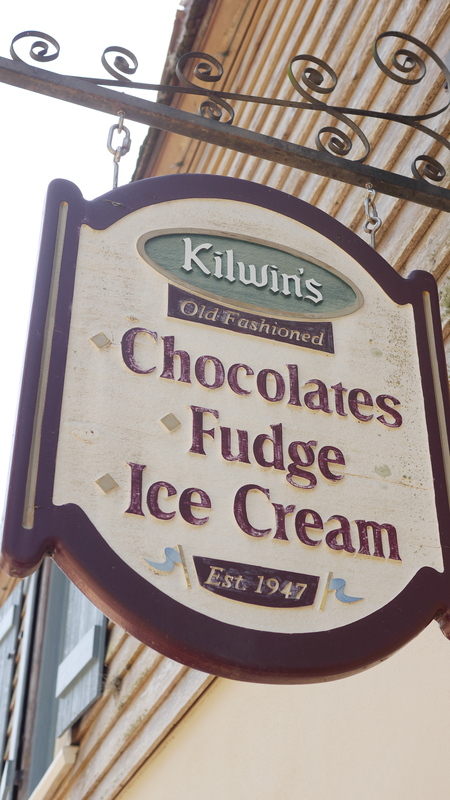 Not only did Kilwin’s have delicious ice cream, but the rest of their confections look just as delicious. 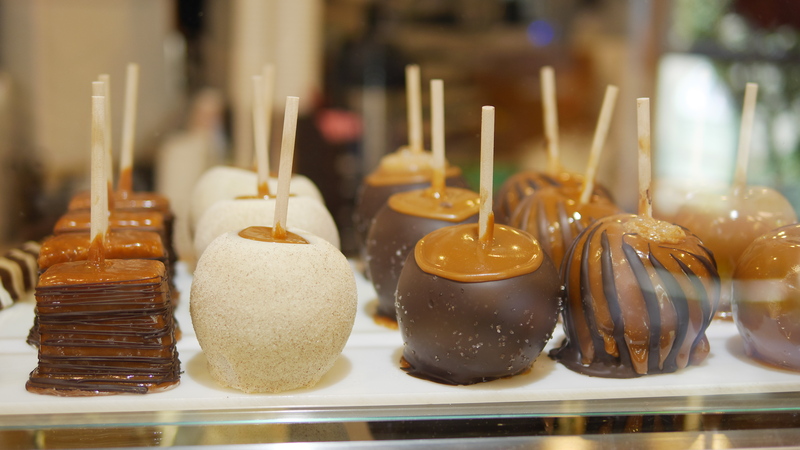 I noticed the beautiful, delicious variety of caramel covered apples. 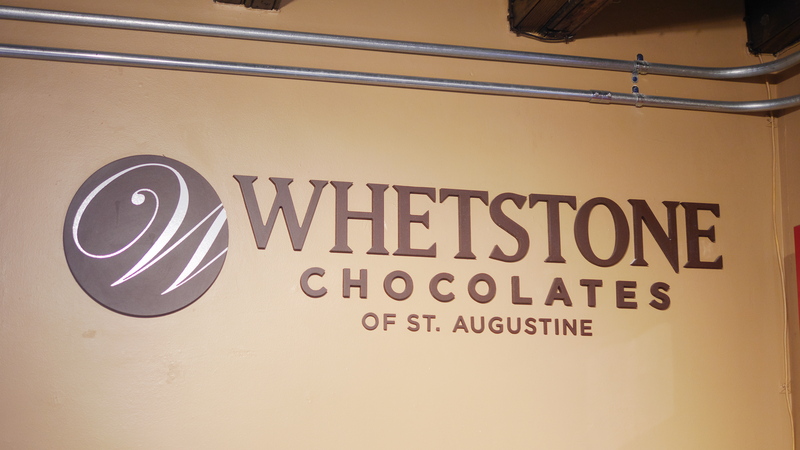 If you love chocolate, you should try the fudge at Whetstone Chocolates. All four different varieties of fudge that we ordered were delicious. 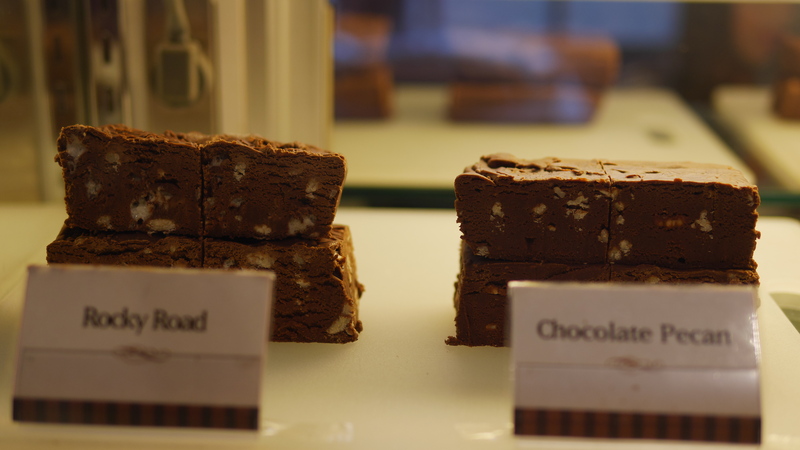 You can find a huge variety of chocolate treats at Whetstone’s. 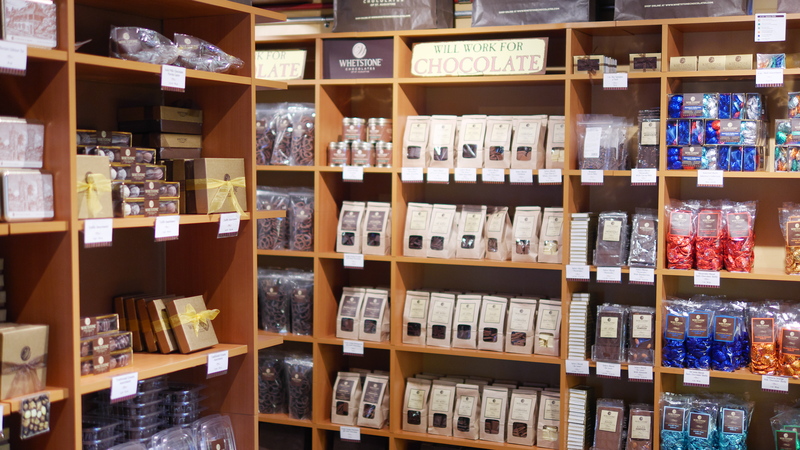 Although we ran out of time to experience the Whetstone Chocolate Tasting Tour, it sounds like a very delicious way to sample the many different types of chocolate. 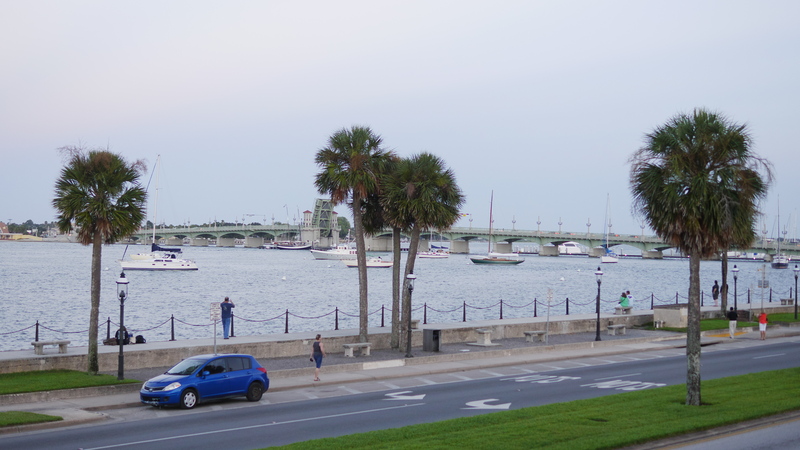 In Part 2, I’ll be sharing the final five locations in my top 10 list of places you’d love to visit in St. Augustine, Florida. For more travel articles, check out the Travel and Restaurant sections as well as the Top 10 Travel Articles. You can also find Theresa’s Reviews on Facebook, Twitter, Pinterest, Instagram, Flipboard and Youtube. I received a free item, but it in no way influenced my opinion. These are some truly gorgeous places! Seems like an amazing place to visit! We love St. Augustine but haven’t been in 5 years. Your photos make me wish we were going there soon. What a fabulous place. Absolutely gorgeous pictures, and the architecture, particularly the college! The chocolate doesn’t look too bad either 😉 I love that you were able to add in some history at the exhibits as well. I might have to make our way there one day. We LOVE St. Augustine!! When we lived in Savannah we went there all the time!! It’s such a beautiful city!! I love St Augustine! Grew up in Florida and it is a favorite! I am local to st augustine and never do the touristy things! I am bookmarking this for future use! I need to take advantage of this great city! That’s so awesome Denise! I lived there a while back. It’s a beautiful area! Great to know for future travels! It looks gorgeous! I would have loved to go to school there too. I hope we’ll be able to take a family vacation there some day soon. Oh boy, this sure does make me want to visit! St. Augustine is such a beautiful place! 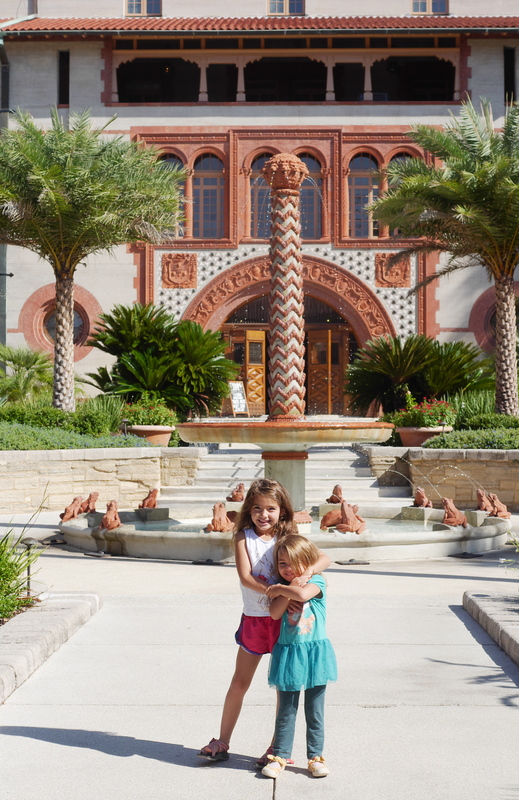 Great suggestions – I’ve always wanted to visit St. Augustine. Those tacos look delish! I’ve only been there once and it was when I was much younger, but I remember it being such a lovely quaint like town! Greta list for if I make it there again! What a charming place! Seems like there’s a lot to do..will definitely need to visit next time we’re in the area! What a cool lookin trip! What a lovely trip. Thank you for sharing such great tips and beautiful photos. Looking forward to part 2. Oh this looks like so much fun. I’d find the time to go try out all the chocolate! 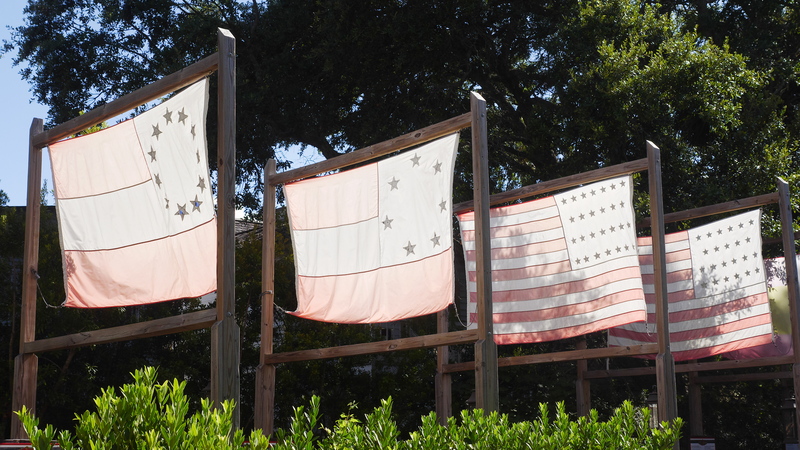 The display with the progression of the US flag is super cool. Also, your girl looks very sassy standing in that hallway! Great list. Yes, it is truly delicious!